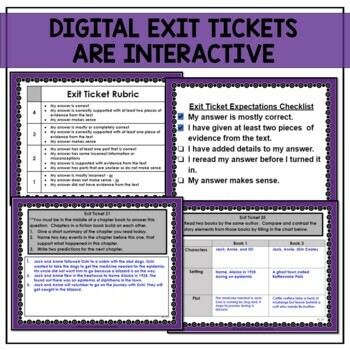 These exit tickets are designed to practice answering questions during guided reading or independent reading. 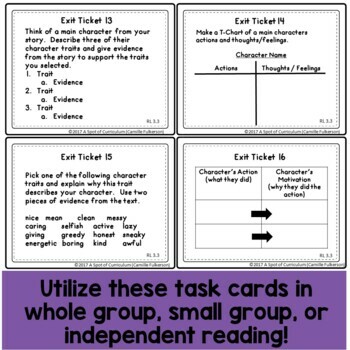 Great for standards based grading, the task cards ask questions from the Common Core Literature Standards for 3rd Grade (RL 3.1 through RL 3.9), and they work with any book as long as it is literature. Use the questions as you work on comprehension during small group instruction or use them to add accountability to your Read to Self or Independent Reading time. 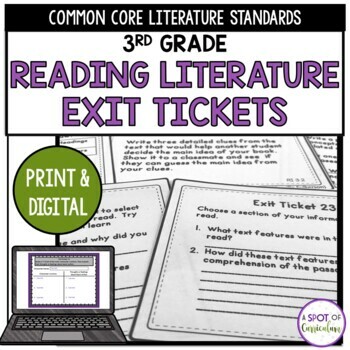 You have the flexibility to assign questions or to let students self-select an exit ticket to match the book they are reading. 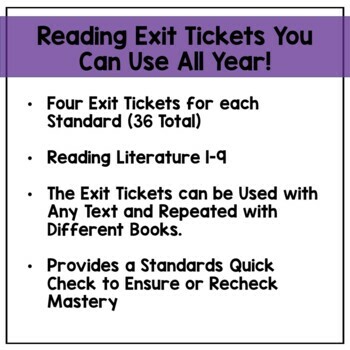 They are a great way to evaluate the degree in which your students are gaining proficiency for each standard, and they add variety to your reading instruction. Rubrics are included to help score responses but there are no answer keys because the questions are meant to be used with many different books, poems, or dramas. ✓ Check out the free preview at the top of the page to see more about the product. ◈ If you like this product, share it with others on Pinterest. You can do this from the Pin It button on the top of this page. ◈ Leave feedback on all products you buy. You earn credits that save you $ on future purchases! ◈ Click the green star above to follow my store. When I upload a new product, I offer that product for 50% off for the first 24 hours. By being a follower, you get an email notification so you never have to miss a new product offered at its best price!